Went back same day tried to run on 6s well look and find out what happened ! “TRAXXAS SPARTAN”, High speed crash. 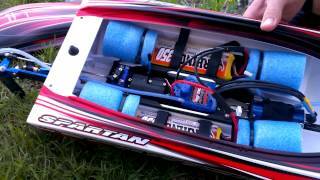 The Spartan is running a 240amp esc special prop and 8s lipos. It looks like the hull flexed so bad the lid popped off and snapped in half. Traxxas Spartan – Unboxing, First Run, Crash and Recovery.